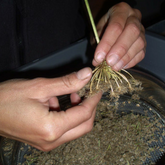 This half-day course is the perfect follow on from our ‘Introduction to Seed Saving’ course, or is ideal for those with some experience of saving seed from vegetables, who are looking to further their skills. We will focus on two types of seed with more complex requirements, those from annuals which easily cross-pollinate; and biennial crops which flower and set seed the year after sowing. You’ll also enjoy a tour of the Heritage Seed Library growing area and will have the opportunity to ask our experts any questions. There will also be a variety of factsheets for you to take home and help get you started. Places are limited and are allocated on a first come, first served basis. Please contact us for more information and to reserve a place. Alternatively, book a place online.